Mistresses is back on ABC! The season premiere was two hours long! That sure was an unexpected treat. I wasn’t sure how they were going to handle Savi (Alyssa Milano) leaving the show. Season 2 was largely about her character, for personal reasons she chose to leave the show. The location for Mistresses had moved. And as a mother I understand why she left, she was not going to relocate her family. When she took the job it was in one location and then they decided to move it. I really wish they would’ve stayed in the original location so Alyssa would still be with us. But alas we have all moved on. 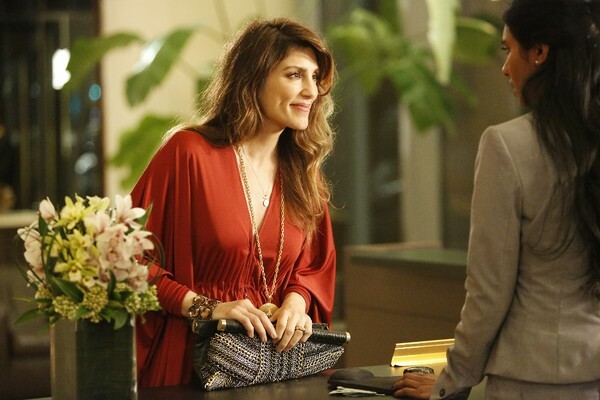 In the season three premiere we meet Calista Raines (Jennifer Esposito), a big name designer. She definitely has flare and charisma. While it did seem a tad forced in the season premiere when introducing Calista into the story line it’s now feeling like she belongs. And there’s only been 2 shows so far! The writers on Mistresses did a seamless transition with phasing Savi out and bringing Calista in. Not an easy task to complete. Now it’s been two weeks and I am surprised and a little saddened to say I don’t even miss Savi and I love Calista! Season three has already been full of some dramatic scenes, I cannot wait to see what else is in store. So far, Savi was written out with the story line of her seeing Joss and Harry’s make out session on the beach – season two season finale. She has quit her job, taken off to travel Europe and will not respond to anyone’s phone calls. Until she responded to Joss’s text and told her she no longer had a sister! Joss is frantic to save their relationship. But there is really nothing she can do, except let Savi go and be ready for when she wants to talk. Joss told Harry they couldn’t be together for the moment. She came clean to Scott about kissing Harry and called off the wedding. Scott did not take it well at all. He asked Joss to leave his house by the end of the day and took back everything he had ever given her! Joss ends up staying with Karen for now until she can get back on her feet. Even with all this going on, she bumps into Calista Raine and forms a friendship and lands an amazing job. She is struggling wanting to be with Harry and the timing. So this season will be interesting to see when and how they end up together. April has really done a 180 on how she feels about the other woman! It all happened so fast I’m not even sure how it happened. But now Scotty (Lucy’s 1/2 brother) is living with them as well as his uncle. April is dealing with the insurance company wanting the death insurance policy money back since Paul was not really dead. That’s $200K! She doesn’t have that type of money. So now April is sharing her house with her dead husbands baby mama’s brother and son, trying to figure out how to pay back the money and dealing with a very pissed off rebellious child. And then there’s Karen. Boy did she go through a dramatic crisis last season that has left her pretty shaken and scared. She wants to do something good and feel like she has a purpose. So when a doctor begs her to donate her stem cells to help save the love of his life she agrees. Even though she knows it will be a painful procedure she feels like it’s a penance for all the poor choices she has made. But now it seems as if she is falling for the doctor! I’ll admit he is dreamy but a bit of jerk. He’s happily married and completely devoted to his wife. So I’m really sure if this will develop into anything other than Karen getting her feelings hurt. With so much going on I cannot wait to see this weeks episode. I cannot decide which story line intrigues me the most. They are all so juicy! So remember Thursday nights on ABC!